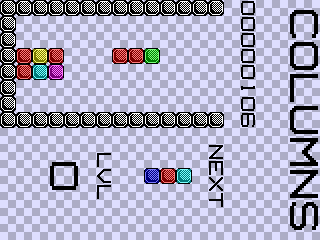 Description: Tetris-like puzzle. It takes place inside a tall, rectangular playing area. Columns of three different symbols (such as differently-colored jewels) appear, one at a time, at the top of the well and fall to the bottom, landing either on the floor or on top of previously-fallen "Columns".